In this lesson, you will write Python code in Jupyter Notebook to import tabular data from text files (.csv) into pandas dataframes. Be sure you have completed the lessons on Importing Text Files Into Numpy Arrays and on Intro to Pandas Dataframes. 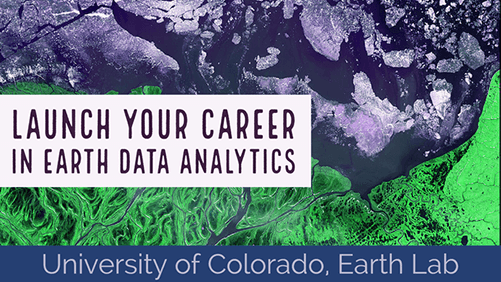 Be sure that you have a subdirectory called data under your earth-analytics-bootcamp directory. For help with this task, please see the challenge for the lesson on Intro to Shell. The code below is available in the ea-bootcamp-day-5 repository that you cloned to earth-analytics-bootcamp under your home directory. In the lesson introducing pandas dataframes, you learned that these data structures are inherently tabular, meaning that all values (or cells) have a row index and a column index, even if the data only has one row and/or one column. You also learned that unlike numpy arrays, pandas dataframes are two-dimensional by default and are composed of rows and columns. Each column in a pandas dataframe can have a labeled name (i.e. header name) and can contain a different type of data from its neighboring columns. You also learned that due to its inherent tabular structure, you can query and run calculations on pandas dataframes across an entire row, an entire column, or a specific cell or series of cells based on either location and attribute values. In this lesson, you will learn how to import tabular data from text files (.csv) into pandas dataframes, so you can take advantage of the benefits of working with pandas dataframes. In this lesson, you will work with tabular data that orignate from comma delimited (.csv), or CSV files. As you learned in the lessons on numpy arrays, CSV files are a very common file format used to collect and organize scientific data. You also learned that unlike plain-text files which simply list out the values on separate lines without any symbols or delimiters, CSV files use commas (or some other delimiter like tab spaces or semi-colons) to indicate separate values. CSV files also support labeled names for the columns, referred to as headers. This means that CSV files can easily support multiple columns of related data. Furthermore, these columns are data do not all have to be of the same type (i.e. all numeric or text strings). For example, data for the average monthly precipitation data for Boulder, CO and the month names can actually be stored together in a comma delimited (.csv) file. Due to its tabular structure with headers, CSV files are very useful for collecting and organizing datasets that contain related data of different types and across multiple locations and/or timeframes. From previous lessons, you know how to import the necessary Python packages to set your working directory and download the needed datasets using the os and urllib packages. To work with pandas dataframes, you will also need to import the pandas package with the alias pd. Begin by reviewing these tasks. Remember that you can check the current working directory using os.getcwd() and set the current working directory using os.chdir(). Recall that you can use the urllib package to download data from the Earth Lab Figshare.com repository. For this lesson, you will download a .csv file containing the average monthly precipitation data for Boulder, CO and the month and season names. Using the read_csv() function from the pandas package, you can import tabular data from CSV files into pandas dataframe by specifying a parameter value for the file name (e.g. pd.read_csv("filename.csv")). Remember that you gave pandas an alias (pd), so you will use pd to call pandas functions. Be sure to update the path to the CSV file to your home directory. Recall from previous lessons that you can check the type of any data structure using type(variablename). For pandas dataframes, you can also easily see the data by simply calling the name of the pandas dataframe. No print() function needed. As you can see, the months and precip data can exist together in the same pandas dataframe, which differs from numpy arrays. You can see that there is also a column for seasons containing text strings. You can also see that the indexing still begins with , as it does for Python lists and numpy arrays. Notice that you did not have to use the print() function to see the contents of the pandas dataframe, and that it is displayed with clear tabular formatting. Congratulations! You have now learned how to import tabular data from CSV files into pandas dataframes. Download a .csv file containing the monthly precipitation for Boulder, CO for the years 2002 and 2013 and the month and season names (precip-2002-2013-months-seasons.csv)from https://ndownloader.figshare.com/files/12710621. Be sure to assign a useful variable name that is short but indicative of what it contains (e.g. precip_2002_2013). Import the data from this .csv file into a pandas dataframe. Print the data type of your new pandas dataframe as well as its contents.